A master plumber is a highly experienced plumber who possesses advanced installation, maintenance, and repair skills. 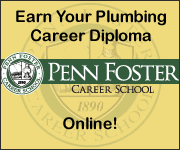 A master plumber is licensed by the state in which he works, and is subsequently authorized to hold the position of employer or contractor, which grants one the capacity to teach and employ plumbers at the journeyman level. The main duty of a master plumber is to install, repair, or remodel any size and style of plumbing system. A master plumber’s job requirements are more extensive than that of a journeyman’s, for a master plumber is also responsible for evaluating work orders, coordinating and delegating work orders to employees, and meeting with potential clients to review plumbing problems or needs. Similar to the journeyman exam, master plumber exams are state-specific tests used to assess an individual’s abilities, and to determine whether an individual possesses the skills and knowledge that a state requires to work as a licensed master plumber. To help you pass your Master Plumber License Exam on the first try, we recommend the Master Plumber Practice Exam with 325 questions covering all actual exam topics. The amount of work experience that one must possess prior to taking the master plumber exam also differs across states, but the majority of states require at least four to five years of experience at the journeyman level. Once certified, master plumbers are expected to be capable of installing, repairing, and maintaining any plumbing system, as well as training and managing employees assigned to plumbing projects of all sizes. Typically, master plumbers earn greater wages than those working at the journeyman level. According to Salary.com, the salary range for a master plumber peaks at approximately $65,300, while the high range for a plumber at the journeyman level comes to approximately $50,000.